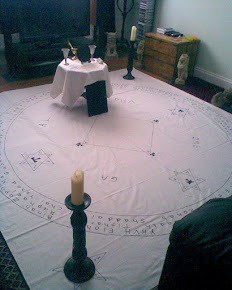 This blog is going to contain some of my magical practices, (the ones I am willing to talk about in public ;)) reviews of occult books, and my general musings that will show how I perceive the mysteries of the occult world. I have debated a long time about doing this, because I am a rather private person, but, considering all things change, then so must we. After all, we are supposed to be entering a new age when more knowledge will become available. I hope that some of my writings will contribute to this dawning of a new age, and in the process also help others find their way along the magical path. Just as some other magician's writings have helped me along my own path, and will continue to do so too. Here is my first topic which will show my insight into the nature of symbolism, perceived and understood through the meaning of allegory. And considering we have just had Halloween and Christmas is the next festival just around the corner, it is a rather apt topic to write about. The other day on Facebook, I stumbled upon a post by Sorita de Este that sugested the image of a witch on a broomstick at Halloween, probably originates with an Italian folklore character called La Befana. So I thought I would look up the legend of La Befana to see if I could find any parallels with the ideas I have about the symbolism of a witch. I was pleasantly surprised to find some corresponding symbolism in the legend of La Befana, that could show a possible association between the two. According to the legend, La Befana is an old woman who was known to fly on her broomstick at night on the eve of January 6th, delivering gifts to children throughout Italy. As the story goes, while La Befana was busy cleaning her house, the three wise men knocked on her door asking her for directions to where the Son of God was because they had seen his star in the sky, but she did not know, and kindly offered them food and shelter for the night. After dinner the three wise men asked her if she would like to join them on their journey to find the Son of God, but La Befana refused because she was too busy cleaning and sweeping her house. Later on she regretted her decision, so she took a basket and filled it with treats, grabbed her broom and off she went to find the new born Son of God. This proved to be difficult, so she stopped every child and presented each one with a treat in the hope that one of them would turn out to be the Christ child. To this day she carries on searching for the divine child, and on the night of every epiphany eve she rewards good children with sweets or fruit, and the bad ones get a lump of coal! As is usual with folklore tales, they often contain a deeper meaning which often gets forgotten as time goes by. These folklore tales then get passed down through the generations as customs preserved in the traditions of each culture. Like most folklore tales the stories are often a syncretic form of different beliefs and customs. Just as some scholars have pointed out that La Befana is also associated to the Roman goddess Strinia. The name “Befana” is said to be a mistranslation of “epiphany” which, as many will know is the Christian festival that commemorates the visiting of the three Magi to the baby Jesus, and the physical manifestation of Christ to the Gentiles on the twelfth day of Christmas, Jan 6. The number twelve is a very significant number used many times in ancient writings. For e.g. the twelve labours of Hercules, the twelve signs of the zodiac, the twelve legions of angels and the twelve apostles, to name but a few. For the number twelve represents the powers through which the light of divinity manifests. Therefore the word “epiphany” means an appearance or manifestation of divinity and/or, a sudden illuminating insight of perception. If we put these two meanings together they form an interpretation giving us the “divine knowledge that illuminates the mind”. La Befana more than likely represents the manifestation of divine knowledge in the physical form, this is because the female as a symbol represents matter, henceforth why we have such words that represent the female, like the Latin “mater” from which the English words mother, matron, matter and material are derived, and through which divinity manifests and where its holy presence resides, like the Shekinah. How does the witch as a symbol fit into this idea? I may hear you ask. To answer this we need to take a look at the etymology of the word “witch.” There has been suggested various origins for this word, with three choices mainly used, one of these being “weid” which is the most favoured, and means “to see” or “to know.” This is the root of the Latin “video, videre” “to see”, the English “wit”, which means “intelligence” or “to know” and, the German “wissen,” “to know”. All this implies that the witch is a wise person. 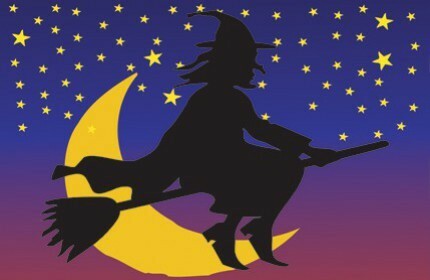 This could probably explain the reason why the image of the witch and La Befana are described as flying through the air, because divine knowledge comes down from above through spirit, and the words for “spirit” in many languages are the same as those used for air, wind and breath. The broomstick is used because it symbolises a cleaning process. (a purification) A clearing away of the impurities of the lower nature (hence why it sweeps the floor) with divine knowledge to allow divinity to manifest within the individual. After all, as the ancient proverb says; “cleanliness is next to Godliness”. With the above information it clearly shows from an esoteric perspective similarities of meaning between La Befana and the image of a witch. Taking these into account it can shed some light on a possible meaning of the story of La Befana. The wise men or magi, are the higher qualities of the soul (because they come from the east) bearing three gifts that represent the triune aspect of divinity, mind, spirit and soul. In the story of La Befana they knock on her door, which must represent the door of knowledge, because they are seeking to know the way to go. They stop for dinner, i.e. to consume knowledge. La Befana did not leave with the three magi straight away because she was to busy cleaning her house, which probably means after a certain time of purifying the lower nature, ones knowledge has spiritually evolved enough to be ready to search for divinity (Christ). So one prepares with offerings of spiritual nourishment and goes in search of divinity. On the night of January 5th (night also being another symbol for matter) La Befana (higher Knowledge) gives to us (the children of God) the sweet taste and/or fruits of divine wisdom. The ones who are given the coal are those who still have to realise and understand the spiritual nature of things, and are therefore given the coal (hidden knowledge) which they must learn to understand and transform into the sweeter truths of spiritual wisdom. twas bout time! Welcome to the blogging... comunity.. thingy.. :D Can t wait to read your materials! Blogger doesn t show me the follow button, but I ll be back, I wannna be first. I think a may just do that soon. thanks! Are you still requesting books as payment?